Born 1883 in Palatka, Florida and raised in Yonkers, New York, Joseph Warren Stilwell served in the U.S. Army for 42 years. A 1904 graduate of the U.S. Military Academy at West Point, Stilwell served in World War I as an intelligence officer for the Fourth Army Corps and was awarded the Distinguished Service Medal for his outstanding achievements. Stilwell was the military attache at the U.S. Embassy in Peking from 1935 to 1939 and became fluent in Chinese. 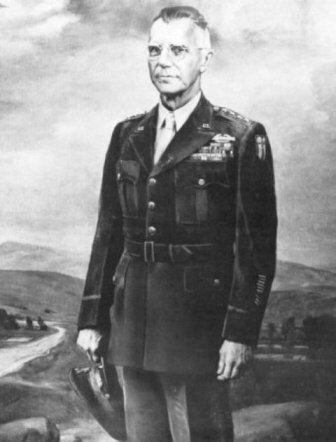 Named chief of staff to Generalissimo Chiang Kai-shek in 1942, Stilwell was the senior American military commander in the China-Burma-India Theater during World War II. Nicknamed "Vinegar Joe," in part for his blunt candor, he was known for his willingness to share the hardships of the common soldier. They called him "Uncle Joe." When Japan forced the Allied withdrawal from Burma in May 1942, Stilwell, at age 59, led a group of some 100 soldiers and civilians on a daring 140-mile march through the Burmese jungle and safely into India. He later commanded U.S. and Chinese forces in the reconquest of Burma. Stilwell received his fourth star on August 1, 1944, the same month Allied troops reclaimed northern Burma. He was constantly at odds with Chiang Kai-shek over the use of Chinese forces, which eventually led to his removal at Chiang's request in October of 1944. The Ledo Road was opened in January 1945 and together with the Burma Road was renamed Stilwell Road at the suggestion of Chiang Kai-shek. Later in 1945 he was awarded the Legion of Merit and the Oak Leaf cluster of the Distinguished Service Medal. In 1946 he was appointed commander of the Sixth Army in charge of Western Defense Command. He died October 12, 1946 in San Francisco, California. He is remembered as one of America's great generals.